Montgomery County, Tennessee, population 172,331, is located 30 minutes northwest of Nashville at the Tennessee-Kentucky state line. We are one of the most historic, yet progressive counties in the region and home to the fifth largest city in the state. 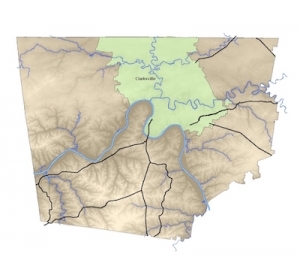 Clarksville, Tennessee, population 132,929, is located about 35 northwest of Nashville, south of the Kentucky border. Interstate 24 has four exits to access the state’s fifth largest city, and the Exit 4 area is the major retail corridor with a mall and various shopping centers located along Wilma Rudolph Boulevard, which pays tribute to the city’s Olympic gold medal-winning native. Additionally, Clarksville is home to one of the fastest growing four-year universities in Tennessee. With an enrollment of more than 11,000, Austin Peay State University is adding student housing on campus and is anticipating more building without the aid of state funding.